You’re better off going to your local used car dealers in Albany, NY rather than following this new trend of buying a used vehicle online without actually seeing it first. After all, dealerships have changed for the better and continue to evolve for the sake of their customers’ best interests. But you remember what I’m talking about; whenever you think of a used car dealership, the stereotypical image of a salesman dripping in gold, wearing a Hawaiian-pattern shirt halfway open, with sunglasses and a sketchy, thick caterpillar mustache pops into your head. While that might have been true at one point in time, used car dealerships have come a long way since then, and so have the salesmen…and women. You just need to find the right dealership that works for you. Finding the right one provides you with numerous benefits that buying a car strictly online can’t. But, that’s a discussion for another time. First and foremost, it’s important to cover a few of the reasons why you should avoid buying a used car from a website, sight-unseen. When I say online-only car buying, I’m talking about buying a used car online “sight unseen.” A phrase that’s being thrown around the internet to help describe this latest cyber-purchasing phenomenon. For some strange reason, it’s actually gaining traction, and the consumer experiences range from (not surprisingly) horrendous, to surprisingly lucky. I’m talking about companies like Shift Technologies Inc., Beepi Inc, Vroom Inc. and Caravan LLC. These companies all promise to have a used car inspected and delivered to your doorstep after you agree to purchase it off their website. While that seems like a promising concept, it’s really not. But, this article isn’t about trash talking these companies. It’s about keeping you safe when it comes to buying cars — especially used ones — from the internet, along with pointing out the risks you’re taking if not probably prepared and armed with research. It’s 2016, and it’s okay to tell yourself that you’re better off buying a used car from a dealership, rather than roll with the times and buy online. Because used car dealerships have changed and it’s worth finding out how. When buying a vehicle from an actual brick-and-mortar dealerships, the sales team increasingly strives to make the process as stress-free as possible. But if you are buying a car online, it’s all done over the phone or via e-mail. Not only does this create an unnecessary and more complicated exchange, but it’s impersonal. Even though it’s 2016 with technology connecting us to the rest of the world, an e-mail or a phone call across the country still isn’t the same as physically meeting the salesman or woman you’re dealing with. You aren’t able to get a feel for what type of person they are, and you don’t even get to look at the type of establishment they’re running. The pictures of the vehicle or the car might look nice, but you don’t know if they’re honest images or not. Because even at a quick glance, the images almost look too good to be true, like they were pulled from a pool of shiny stock images, which they probably were. Plus, you can’t get under an image and inspect it like you could actually seeing the car. How can you effectively check for rust or issues under the hood, when the only way is to request more images? Even then, the images can still be taken from a deceiving angle to hide any issues. 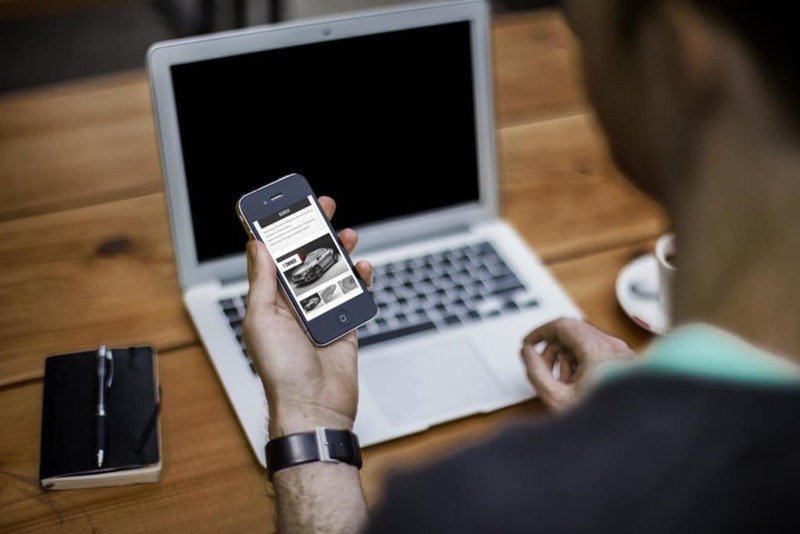 Online dealerships promise to have the vehicle inspected, but how thorough will they be? There is no way to know except for the words the company puts on their website, and what the faceless sales representative tells you over the phone. As a consumer, the number one rule of buying any car — especially when it comes to used cars — is to give it a thorough inspection yourself. Even if the dealership is trustworthy, they could have missed something on the inspection, or something could have happened on a test drive they didn’t notice. Being able to inspect the car yourself is imperative, and key to playing your trump card — walking away. When buying a car online, that isn’t possible. At the end of the day, you’re simply taking a shot in the dark because you’re ultimately purchasing the vehicle sight unseen, which makes it easier to wind up scammed. It’s easier to get scammed over the phone or online, not only because you can’t judge the product, but also because you can’t judge the person selling it to you. When buying used cars, a very real threat is possibly ending up with a lemon. For those who don’t know, a lemon is a used vehicle that’s been in an accident and just had covered up work done to it to hide the more serious damage. If all you can see are images of what the vehicle looks like on the outside, then how can you tell what damage has been done underneath the patched-up paint? A couple of reviewers from Yelp who bought from Shift have had bad experiences with sight unseen car buying. One said he had to take his used car to a mechanic soon after his purchase. He said that Shift claimed to have done an inspection and repaired parts — but it ended up being only quick fixes to the engine. When he took it to the mechanic, the vehicle needed more work done so the repairs to the engine weren’t just temporary. If the company is only into quick fixes, that doesn’t bode well for how the cars are inspected. Another woman reviewed Shift recently, on September 4th, 2016, and said the operations were horrible. She got a car that she wasn’t satisfied with, and requested a return after only three days of owning it, having put 70 miles on it. After five days, Shift picked it the vehicle, which was well within the seven-day return policy. But, it’s been over two weeks now, and still not a dime of her refund has been dispensed, with everyone she talks to giving her a different excuse — including the date of her return request not being filed. Just goes to show that buying a used car exclusively online has plenty of drawbacks to it, and the risk of an easy scam for these companies outweigh the rewards you’d glean from risking the purchase. Perhaps the biggest concept I can’t wrap my head around is why someone would buy a vehicle without being able to test drive it first, especially a used one. Even if the images are honest and the mileage is correctly represented on the website, you could be driving a car and have the engine blow up just a few days later. Why? Because the more serious issues occur on a vehicle when you’re actually driving it. Without being able to test drive it and see if you have any of these issues, you’re buying a car blindly. Hence the buying term: sight unseen. All of these issues stem from not physically being able to interact with the salesperson or the product. Which is why heading over to a used car lot is a lot less stressful. Sure, it might be slightly more complicated than just clicking an image to buy a vehicle. But, at least you know what you’re getting for certain.